With the turn of the century, traveling with a mini trailer has become more and more popular amongst those seeking to enjoy time away from home on their own or with loved ones. We see the number of mini trailer owner’s increase year after year and we have begun to ask ourselves why people would prefer a trailer of this size, over a luxurious trip with a nice stay at a 5-star resort? We will discuss in detail the reasons we think are responsible for this happening. 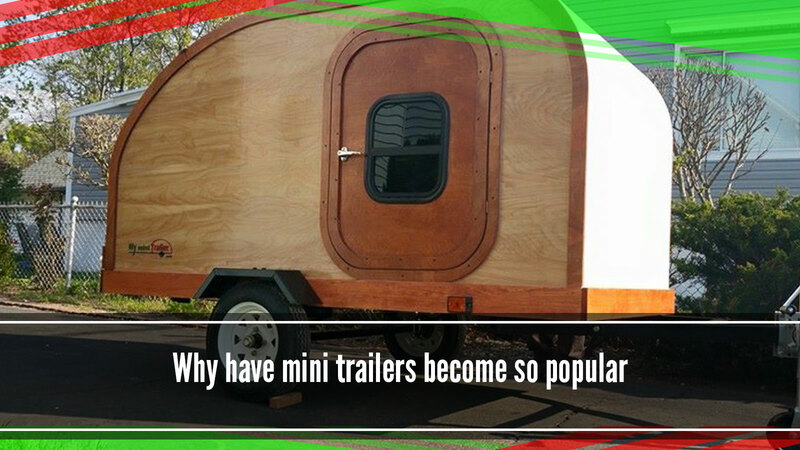 One of the reasons I believe people prefer mini trailers over a luxurious trip is because of the economic downturn. People’s desire has always been to travel and to encounter new places, many can afford luxurious trips with everything included but since the economic downturn, this kind of a trip has been further away from many people’s hands. We have found a large number of families turning to mini trailers because of this since it allows them to save money if they plan on going on various trips because the trailer provides all of the comforts needed to enjoy said trip. Many others prefer traveling in a trailer since it provides the opportunity to create a tighter bond with those you travel with. Being with someone else for an extended period of time can either fortify a relationship or break it. This is because of the long hours spent together on the road when camping somewhere for the night in your trailer. The trailers have enough room for 2 so sharing a bed is required making it a romantic little love shack at the same time! The trailer also has enough room to carry all of your materials when traveling to ensure quality time. Mini trailers continue to be popular because they can provide necessary amenities in the most remote places. Having to travel through the forest to reach dreamlike sceneries found in many places across America can be a tough expedition, and to be honest the mini trailer cannot reach many of these since they require arduous climbs, but a mini trailer can easily reach other places just as beautiful that you can enjoy just as much. Imagine sleeping inside your trailer beside a crystal clear lake at the foot of gorgeous mountains surrounded by pine trees. A five-star resort can’t beat that! In conclusion, mini trailers have become extremely popular basically because people have found that you can have a much better time with one of these because of the value it brings owners and their families. They have found that the experience shared with loved ones in one of these, although a less luxurious option, has brought the family closer together since things like a television set, games room, and other resort activities, only makes room for a family to distance itself and take on activities of their own liking, while using a mini trailer eliminates these activities making ample time for family.. You simply cannot go wrong with a mini trailer because of the comfort provided, making them very popular in today’s world.